Virtual GPS is a GPS simulator software. You can use it to simulate a GPS receiver unit connected to your system. It's ideal when you need GPS input, but you have no signal or for development purposes. Virtual GPS supports various NMEA sentences, so it can be used with any GPS mapping software. You can use it using a null-modem cable connected to two physical serial ports or you can use one of the virtual serial port software from the market. 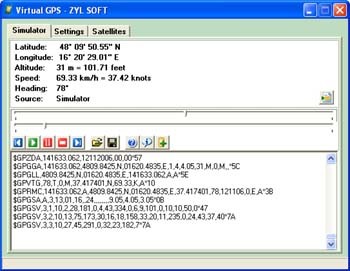 Virtual GPS is a GPS simulator software. ...... NMEA 0183 (or NMEA for short) is a combined electrical and data specification for communication between marine electronic devices such as echo sounder, sonars, Anemometer (winds speed and direction), gyrocompass, autopilot, GPS receivers and many other types of instruments. It has been defined by, and is controlled by, the US-based National Marine Electronics Association. Virtual GPS Supported NMEA sentences: GPGLL, GPGGA, GPVTG, GPRMC, GPGSA, GPGSV, GPZDA, GPWPL, GPRTE, GPAAM. Virtual Switchboard toolbar providing fast access to essential phone services. Qweas is providing links to Virtual GPS 1.38 as a courtesy, and makes no representations regarding Virtual GPS or any other applications or any information related thereto. Any questions, complaints or claims regarding this application Virtual GPS 1.38 must be directed to the appropriate software vendor. You may click the publisher link of Virtual GPS on the top of this page to get more details about the vendor.